If you’re visiting with us for the first time, we’d like you to know exactly what to expect. We want to provide you with a great experience, and will make sure that you feel welcome and supported every step of the way. Many people have described our clinic as warm, friendly and inviting, and we hope you agree! Have your photo ID, insurance card and list of medications available on your first visit. If possible, complete your new patient paperwork online before your appointment. Click here to access. This paperwork CANNOT be completed on a tablet or a cell phone. You DO NOT need to print anything out just press the submit button. Wear comfortable, loose clothing for your visit. Remove belts, jewelry and all items containing metal. If your symptoms are due to an auto or on-the-job injury, fill in the appropriate portions of the online paperwork. If you’re consulting with us due to a work injury, notify your work supervisor prior to your visit. Please avoid wearing fragrances on your visit out of consideration for those patients with allergy sensitivity. Please turn off or silence your cell phone while in the office. The first visit will take between 60 and 90 minutes. As you enter the office, you’ll be warmly greeted by one of our staff members. 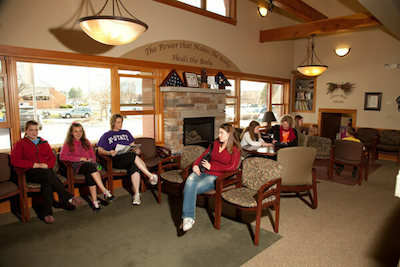 You’ll be invited to sit by the fireplace in our cozy reception area as you complete any necessary paperwork. The second visit usually takes place later the same day or the following day, and is typically 30 – 45 minutes in length. During this visit, the doctor will deliver a report of findings, which is a thorough review of your examination, scan and X-ray results. Spouses or family members are welcome and encouraged to accompany you on this visit to assist them in understanding the extent of your health issues. Customized care options will also be discussed, and a plan of action reviewed to help you get out of pain as quickly as possible. You may then choose to start on your recommended treatment plan with your first gentle chiropractic adjustment. We’ll also have you meet with our patient accounts representative on your second visit. If you have insurance, we’ll verify your benefits for you. We’re also happy to complete and file all insurance claims pertaining to your care. If you don’t have insurance, or have a high deductible, we’ll do our best to provide a payment plan that’s convenient and affordable. We can offer this financial option through a program called ChiroHealthUSA (CHUSA), which is a discount medical plan. Our office is a participating provider through CHUSA. For only $49.00 a year, an entire family can join the network, making every member eligible for time-of-service discounts at our office. A regular office visit is much shorter than the first two visits, making it easy and efficient to heal from injury and optimize your health. Most visits are 15 minutes in length, and typically involve a short review of your progress, a brief exam and a customized chiropractic adjustment. Our office is friendly and accommodating, and children and adults alike appreciate our experienced care. We’d love to partner with you in helping you to feel great. Contact us today for a same day appointment!